Lucas Walters, a co-owner of Tutu’s bar, experienced quite the unpleasant surprise when he came to work a couple of days ago. At night, somebody had hung a huge billboard just above the mural he has been co-curating with Beth Tully, famed producer of Fountain Art Fair. The mural on the Varet Street side of the Tutu’s building was created by Austrian street artist Nychos and features a whale so amazing and complex you could stare at it for hours. No wonder the mural quickly became one of the most photographed walls in Bushwick, occupying “the front pages of the Internet”- Reddit for days. “We wanted to create a Bushwick version of Bowery/Houston graffiti mural, and to bring world-class artists here ” explained Beth Tully, who was outraged about the uninvited guest to this party: a black and white rectangular photograph with a distinct Uncategorized.com sign underneath it. “It is everything I hate about advertising,” said Lucas Walters on the phone. “It’s tacky and untactful. And I want the neighborhood to know we have nothing to do with it,” he continued. “We were really happy nobody had messed with the mural, but this…this is called side busting in the street art world." 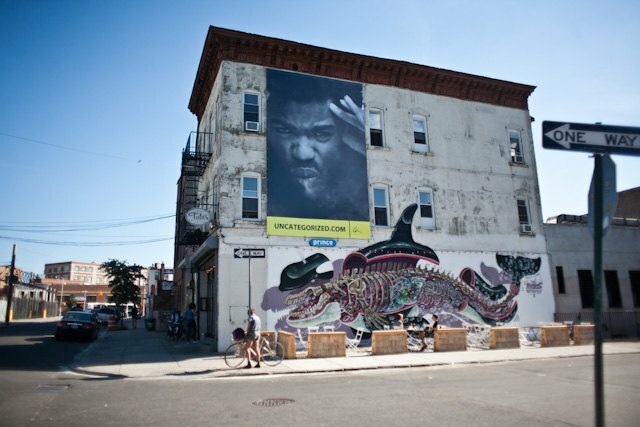 “Right now the billboard displays my art but in the future it will display commercial elements,” pointed out Chi Modu. Chi Modu is not sure how long his billboard will remain in place. “It can be one month, or it can be extended,” he told us. We attempted to contact Prince Media Co, the billboard company who rented the billboard space to find out what’s coming up next after Chi Modu photograph is gone. Unfortunately, without success. You can have objections to the placement of Chi Modu’s art and you certainly don’t have to like his Uncategorized project. But perhaps Chi Modu’s photograph is a good option when compared to the dozens of tacky billboard options Prince Media Co could have placed there, and potentially will place in the future.